Bombing victims in Hilongos. Photographs contributed by Michael Bardos. 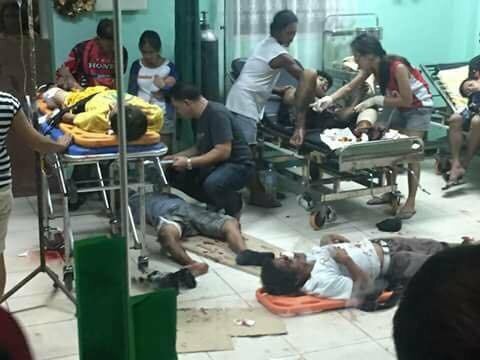 Ten people are reported dead and at least 20 wounded after two bombs exploded during a crowded festival celebration in Hilongos, Leyte, last night. (Wednesday, December 28). A military spokesman has revealed that the improvised explosive devices (IEDs), which targeted a boxing event in the town’s Rizal Square, were remotely detonated by cellphone at 9.20pm. The town’s Police Chief Inspector, Alberto Renomeron, has said that a third, unexploded, IED had been found at the scene. Less than an hour later, in Mindanao, a roadside IED injured seven. On the previous evening, on the same island, four were hurt in a grenade attack on a shop. Speaking in the early hours of this morning, presidential spokesman Ernesto Abella confirmed the Hilongo attack. He said: “Ten have been reported dead, 20 injured, according to Social Welfare Secretary Judy Taguiwalo.” Mr Abella had earlier said that 27 people were reported injured in the blast. First Lieutenant Cherry Junia, public affairs officer of the military’s 8th Infantry Division, told Rappler that the IEDs exploded in barangay Central Poblacion in Hilongos town during a boxing event held as part of the town’s annual festival. “Initial investigation disclosed that the suspected IEDs were cellphone detonated, she said. At least 23 were taken to the Hilongos District Hospital for medical treatment, the military officer added. Visayas State University student Ritchmon Relente, who took the photograph posted in this story, said the explosion occurred near the tent right before the announcement of the winners of the boxing match. He said a second blast occurred seconds later. No group has taken responsibility for the blast, as investigations continue. Meanwhile, at least seven people were injured when an IED went off along the national highway of Aleosan, in North Cotabato. Lieutenant Colonel Edgar Delos Reyes, 34th Infantry Battalion commander, confirmed that an explosion took place in Sitio Dos, Barangay Pagangan at about 10:15pm. A second IED found at the site had failed to detonate. The explosion is less than 20 kilometers away from the site of the Christmas Church attack in Midsayap town where 20 persons were injured. See our report on this attack here. On the previous day (Tuesday, December 27) a grenade attack on a store in Cagayan De Oro City in northern Mindanao injured four, including a 6-year-old girl. A grenade was thrown towards the Jul-Zal Store in barangay Lumbia at 8pm by an unidentified motorcyclist, according to army spokesperson Brigadier General Restituto Padilla. The suspect had two companions onboard the motorcycle when they stopped in front of the store, shouted “yohoo!” and threw the grenade. Padilla ruled out terrorism, suggesting an “old business grudge” as the motive behind the explosion. It appears that presidential Spokesman Ernesto Abella used unverified figures in his official Palace statement on the number of reported deaths from the Hilongos explosions. In a message to the media at 1am on Thursday morning, Mr Abella clearly stated that 10 people had been reported killed in the blasts, quoting Social Welfare Secretary Judy Taguiwalo. Mr Abella has since issued the following erratum message: “Presidential Spokesperson Ernesto Abella on Leyte bombing: As of the moment, initial but unofficial news feed state that there were no intel reports of bomb threats, nor has anybody claimed responsibility for the bombing. While 27 have been reported injured, no deaths have been reported. The palace has made no further comment on how it came to use an unverified figure in an official statement.